Artistic Dichroic glass earrings make wonderful gifts! 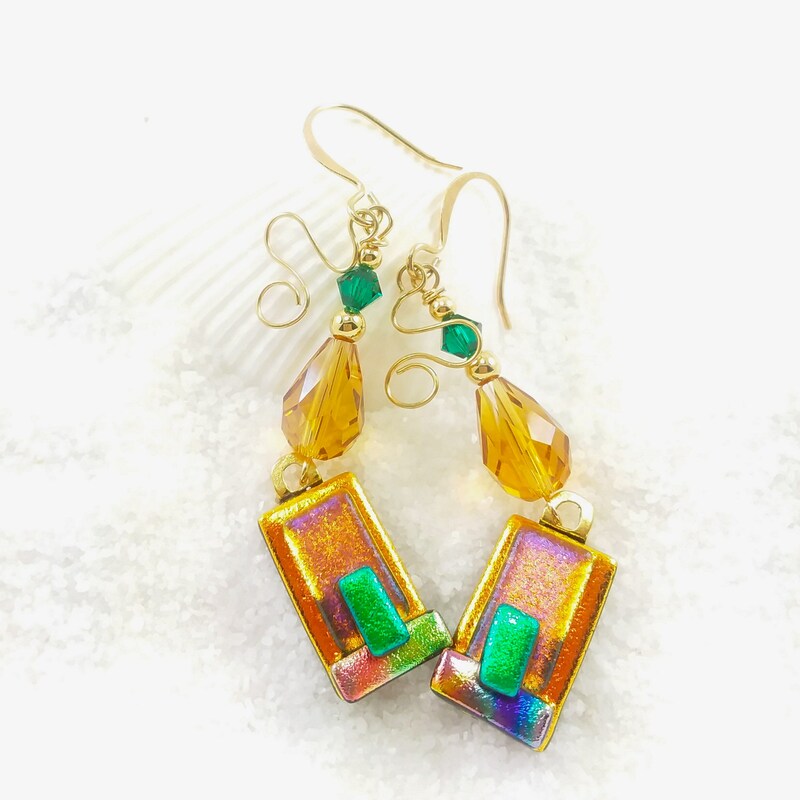 Fused glass artisan earrings are done in the popular "Longer-Gold" style, too! These are all lovingly handcrafted to be worn and cherished for years. And these elegant longer- style earrings are PERFECT for simple weekends, jeans and t-shirts. They dress up nicely, as well! For a subtle touch, try wearing these with your favorite evening dress or even a cute sundress! The possibilities are absolutely endless with these! All of my dichroic glass earrings are made from thin glass and because of that, they are VERY light on the ears! Luscious dichroic orange, emerald green and set with gold! The Swarovski crystals really add that extra sparkle to these jewels, too! I hand-formed some gold plated wires to make some fun squiggies at the tops. They are set with elegant gold-plated bails & ear wires! Gold-plated hand formed wires for extra fun!